If you live in Pasadena or the surrounding San Gabriel Valley, it will be worth your while to drop into Vertical Bistro tomorrow night between 7 – 10 PM. Chef Laurent Quenioux has some new dishes up his sleeve that he would very much like to share with you. And for $25, you can taste a few ofÂ them as well as wash them down with some new beers and/or cocktails. Not a bad open house for the locals. Make sure you RSVP to the appropriate email address below to reserve your spot. 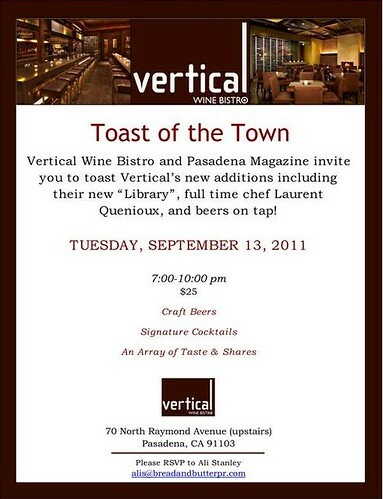 I expect there to be some real tasty French bitesÂ awaiting you tomorrow inside the newly renovated Vertical Bistro. There is even a new “library” for you to check out. Now there’sÂ bookshelves in this wine bar thanks toÂ the new addition, which is a 60-seat dining room. The space now overlooks historic Raymond Avenue. This open house sounds like a great opportunity to try the renovation on for size. This entry was posted in beer, cocktails, Food, Pasadena, San Gabriel Valley and tagged $25, beer, bistro, cocktails, French, Laurent Quenioux, LQ, open house, Pasadena, plates, Vertical Bistro, wine, wine bar. Bookmark the permalink.